Poll 26: Is disc golf really a cheap sport? Spending habits on notice! September 17, 2012 / P.J. Is disc golf really a cheap sport? We know that most courses are free. And once you have a couple of discs you should be good to go, right? I mean, how much more could this game take in regard to spending money? That’s what we’re here to find out. I’ve talked to so many people recently about the money spent on this game. Equipment. Tournament fees. Travel expenses. Leagues. It all adds up if you are highly into the game. We’ll get back to all that in a moment, though. First, I’d like to re-visit last week’s poll to see what people thought about a little football. Turns out not many people change their disc golf routine because of football season. Of the 87 people who cast votes this week, 63 percent (55 votes) said no. The other 37 percent (32 votes) said yes. Personally, I don’t plan anything around football. If I’m home, I’ll flip it on. But if there’s something else I wanted or planned to do, including disc golf, I’ll catch the score/highlights and everything else later on. Let’s see what some readers had to say. I’m probably the minority here, but I don’t follow all that much. Being Canadian, my sports time is normally spent watching hockey, then baseball, then anything else that’s on. You won’t find me out when my Canucks are on TV, but football takes a backseat to disc. I’d be more inclined to watch a DG tournament for 3 hours than a football game, if I’m honest. That makes sense. Though I’d feel the same with hockey and most sports, for that matter. Outside of something major (if my favorite team was in the Super Bowl, Stanley Cup, World Series etc. ), I wouldn’t re-arrange to watch pro sports. They make too much money as it is and they wouldn’t re-arrange their schedule for me! Football = quiet round of disc golf. Great opportunity to play a usually crowded course on a Sunday afternoon/evening! I might have to wander to one of the courses closest to me and see what it’s like to play the course at 1 p.m. or so on a Sunday now that football is back and see if it’s the same as you experience! I don’t have cable and only watch certain football games anyways. I play mostly on weekend evenings and Saturday mornings, so even if there is a certain game on, I won’t miss it.. I can fit both into my schedule. Not having cable definitely helps in making the choice! I golf as normal and DVR my team’s games if they go on during when I’m golfing. I know others who do this as well. Personally, I can’t DVR most sporting events as I’ll need to know the result and go online and look it up! That sounds like more of something I would do as well! Football affects my season big time. I have followed football a lot longer than I’ve been throwing discs. I just passed on the biggest A-Tier in our area because day 2 of the tourney was on Opening Kickoff Sunday. Can’t miss it! As much as I love disc golf, I can golf 365 days a year. We only get 17 Sundays of regular season football! And then, of course, the playoffs! It seems like this sort of thing will always happen though. People will skip many things to do something else, whether it’s football or something else. But it was definitely an interesting bag of responses and votes. Now, let’s move on with this week’s poll. What kind of money do you spend, per year, on this game? When factoring everything, try and consider equipment/gear (discs, baskets, bags, towels, clothes etc. ), tournament/league costs, course fees (if you play on pay courses), and travel costs. It all adds up. So, are you a big spender when it comes to the game? Or do you try and keep it low. Pick a choice in the poll and drop us a comment about your spending habits! 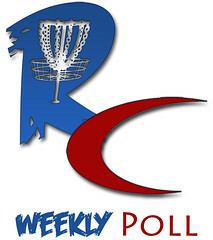 I usually play in 2 tournaments a year (at $30 apiece) and I can plan on buying probably 10 discs. Throw in a new bag or accessory, and that puts me in the 100-499 range. As a student, I wouldn’t be able to afford anything higher. I have a spending problem, folks. I’ve only played in one tournament, so I’m not spending money there. I tend to spend “on the fringe”: shirts, towels, DVD’s, etc. Unfortunately, I’ve purchased two expensive bags (and some cheaper) a year apart from each other, and I’ve done the same thing with two baskets. And then there are discs. The fine folks at Marshall Street Disc Golf have made it very hard not to spend lots of dough on lots of pretty discs; they have an amazing selection, wonderful customer service and a very quick delivery time. I probably should be playing in tournaments, but I am having the time of my life as a recreational player. I’ve probably spent between $75 and $100 on new discs within the past 12 months(minus a few bucks here and there on trade-in’s) and about $50-$75 on tournament entry fee’s. I don’t see that being a lot of money considering how much disc golf I’ve gotten out of it. Along with the fact that I have about twice as many discs as I need. I carry a starter bag with about 12 discs so if I lose one, I just grab one of my extras. If you’re smart about it, disc golf is a fairly inexpensive habit compared to other sports. One softball bat alone costs more than my entire disc arsenal! I’m just getting back into disc golf after over 6 years of hiatus. I think I spent around 250 dollars this year. I played in one tournament (35 dollars) , entered 3 ace races (75 dollars) (haven’t played them yet) and bought 2 new discs (30 dollars) and a few dozen used discs (120).. will probably be in the 500-999 range next year, if I can manage the scratch to enter. I think I need to get an extra job, I’m only playing at the rec/intermediate level (but my age would normally put me in the masters division) so there isn’t cash pay outs at those levels where I play. It’s still a cheap sport. Last Saturday was the proof. There were several groups of new players at my local course with one new disc and having a blast. That’s all you need to enjoy DG, a public course and a disc. When I consider the costs involved, I include things like sunscreen, specialized clothing for staying semi-comfortable in the hot Florida summer sun, Gatorade, and upgrades on last year’s gear. There is always disc golf gear on my Amazon wish list for when I get gift certificates around the holidays, and this year’s list includes a practice basket and a double NutSac disc bag. I don’t spend much on the discs themselves. Most of my collection has come from fishing discs out of lakes. I keep the ones with no names on them, and I used to contact owners if information was written on the discs. Now I just leave the discs with names on them on the shore where people can find them so I can avoid the hassle. Most of the money I spend on discs is to stock up on my favorites so I’ll have them when I lose them. I also buy discs to experiment with different putters, and I am always on the lookout for a good driver that will float in water, but the search continues. All the floating discs I’ve found are either took light or too heavy. I am also on the lookout for a good pair of shoes appropriate for disc golf. I need to find shoes that are comfortable to walk in, but have a sturdy sole that can withstand me dragging my left toe. I’ve tried looking for sturdy hiking boots, but haven’t had much luck yet. should do what a guy did in my area to fix the toe drag problem. I am in the $100 – $499 category this year. I don’t think I will be quite that high next year. I bought a new bag, a basket, and experimented with many discs this year. That experimenting has lead to a group of discs I am very happy with and will likely only buy some spares next year. Unless I play a lot of pay courses next year, I should stay under $100. If you compare disc golf to my other major hobby, fly-fishing, it is very cheap. I definitely spend over $1,000 on fly-fishing a year. I’m new to the game, I just started in January and I’ve been lucky to have a step-dad who’s a pretty solid player and wins a lot gear in his tourney’s. Now that I play, he’s been cool enough to “sponsor” me with plastic, bags, shirts, practice basket, etc. As far as my own expenses go though, I’ve bought a couple of discs, bought specific clothing to keep me as cool as possible in the Texas wild fire heat, not to mention snacks and drinks for long courses and fuel costs. From my home address there are 47 courses within a 50 mile range. This past weekend I drove 41 miles to play a casual round with some friends, only to be rained out on the 4th hole. The closest course to my house is 6 miles away and I’ve never played it, my “home course” is 12.5 miles away from my house. And my favorite courses including my home course are 9, 12.5, 12.7 & 24.5 miles away from my home. Gas and food & drink can add up quickly. But it’s worth it. I’ve lost some plastic over the last two or three years. Sometimes I can get it back and sometimes the water flows too fast, or was very stagnant. So I have spend over $100 a year the last year in plastic, printing scorecards, and I have been buying a lot of boots. When I first started playing I learned I would need a good pair. I now have two, and still want a pair of keen’s, however, that breaks the budget for the whole year. I’m glad that you guys are here, I have enjoyed participating in the blog when I could, and look forward to continuing. I feel like i spend too much, but that is comeing to a end because i figured out that i only spend the money on the discs that works for me. i have 3 latitude 64 river, 2 striker, 1 blitz, 1 flow, 1 core, 3 discraft stalkers,1 innova wahoo, 2 discmania frenzy( which i am tradeing to get the latitude 64 bolt) and 3 gateway wizards. I noticed my Mini tournament and gasoline expenses are adding up a lot, combined with a few tournament costs i end up in the $500-$999 range of annual disc golf related cost. I spend about $100-300 a year on DG, I guess. I only buy a few discs a year, but they are always nice ones. I don’t play in any real tournaments, but do go all out for the Ace Race every year. For my birthday, I go play at Chattooga Belle Farm(3 hr drive from my house), and for my friend’s birthday, we go camping down at the IDGC. So that is where most of the money goes. As it stands though, even with gas prices to drive up to an hour away, it’s still cheaper than any of the other hobbies I have. In Sweden, the major tournaments costs $80, and I have been to 6 of them this year. If you then add one tournament in Holland we looking at $560 plus travels. Travels including food and housing will probably be around the same if not more (gas prices are twice compared to yours! )(but then again, our cars has lower mileage 😉 ). Add maybe 25 smaller travels to our club league, same amount of public transports to practice rounds and travels to quite a few smaller ($10 entry fee) tournaments it really adds up! I would not be surprised if I manage to jump over the $2000 bar. Oh yeah, that’s right, last year I went to Amateur Worlds in Rochester. That year I definitely spend more than that! But it all comes down to how you count, if you include higher living costs regarding food and gasoline and such. And yes, many of us here has been reflecting over how “cheap” a sport it really is! Over and out from Sweden! It seems like most of the comments are from people who play the sport recreationally and take advantage of the potential of disc golf to be a low-cost sport. For those of us that are a little mire serious about competing, it can be quite a different story. I looked at pdga.com to see how many pdga sanctioned tournaments I played. I have been playing a little over 3 years. As an intermediate level player, I looked at about 5 tournaments a year. Last year I jumped to advanced and started becoming seriously obsessed with the sport. I played 27 tournaments including worlds in Rochester. Worlds alone puts me well over the 2000 limit when you look at travel, hotel, rental car, food, etc. So, let’s leave that out for now. I played 26 Pdga sanctioned and a number of non-pdga sanctioned tournaments. Let us say 30 tournaments at 40 bucks at minimum a tournament (for entry fees alone). That’s 1200 bucks. Let’s be ridiculously generous and say I paid for overnight stays only half the time. Two nights at a hotel being conservative would be around 100 bucks. So, 15 overnight stay of 2 nights at a hotel adds up to 1500. I am again way over the 2000 limit. Let’s forget about all that. How about gas? Well, I am going to make a very low guesstimate and say I only spent 50 dollars gettin to and from HALF the tournaments in played. That’s 750 bucks. I don’t think you can add food and drinks like some people have, because you had to eat an drink whether you played or not, although I am sure the amount of Gatorade consumed playing is more than when you are not. How about leagues? In Ohio, I probably didn’t go much over 20 weeks at 5 dollars a week, but in Florida, we play closer to year round and I have played multiple leagues in most weeks. Let’s be fair and assume I actually won some money and that helped pay for leagues, so let’s say 150 dollars in leagues. I am tearing through shoes at an unbelievable rate. I think 200 a year is very conservative. I bought a lot of clothes for the sport, but I am going to leave that out. A person needs clothes whether they are playing or not. Much more of my money was spent on equipment when I was newer to the sport than it is now, because now I usually win most of my equipment in tournaments, but there are still times when I just must have a new disc that has come out. So, let’s say I spend 150 a year on discs. I topped the high limit 2.5 times with ridiculously low estimates on everything. I didnt even add in ace race money, ace funds at tournaments, paying out for 51. Over 6,000 dollars and I know it was a lot more. So, yes, it can be an inexpensive sport to take up initially, but as you get sucked in to the addictive nature of the game, it can become quite expensive. Wow. I just looked over that. A huge number of typos! Sorry. You made me think of what I really spent this year. Forget about discs, bags etc. What makes the sport really expensive is the travel cost. I played only one EuroTour event this year, and the European Championships. Travel and lodging costs are far more than 1000 Euros (or $1300). Playing a tournament of the local tour costs at least 100 Euros (or $130). So I must realize, I’m definitely in the >$2000 group.